President Jammeh caused an international furore when he announced in a televised speech earlier in the week that he would carry out executions of every prisoner on death row by mid-September. According to the most reliable statistics, The Gambia has a total of 47 death row inmates and has carried out only one execution since independence in 1965: Mustapha Danso, convicted of murder for killing an army commander during a failed coup attempt in 1981. The death penalty was abolished in 1993 and reinstated for murder and treason by President Jammeh in 1995 after he seized power in a military coup the previous year. The death penalty is ordinarily carried out by hanging, but firing squad appears to be legal. Article 18(2):As from the coming into force of this Constitution, no court in The Gambia shall be competent to impose a sentence of death for any offence unless the sentence is prescribed by law and the offence involves violence, or the administration of any toxic substance, resulting in the death of another person. The provision, unique in Africa, restricts the death penalty to violent or premeditated murder, and therefore requires an aggravating factor for its imposition. Once a judge determines that a crime was committed with violence or by poisoning, the judge has no discretion to substitute a lesser sentence; the death penalty is mandatory. In October 2010, the Gambian legislature passed a mandatory death penalty for drug crimes, as the country has become a hub for trafficking routes for cocaine, cannabis, heroin, and other drugs en route from Latin America to Europe. The provision was not constitutionally operable, however, because of Article 18(2) of the Constitution, and no death sentences were ever imposed. In April 2011, the legislature abolished the death penalty provision. Moreover, because of Article 18(2) of the Constitution, the death penalty for treason—in terms of section 35 of the Criminal Code—is unconstitutional. The Gambian courts, however, have applied Article 18(2) with some inconsistency. In April 2011 the death sentences on Lieutenant General Lang Tombong Tamba and his associates for a coup attempt were upheld by the Gambian Court of Appeal. The Court did not address the constitutional conflict.However, in January 2012, former Information Minister Scattred Janneh was convicted of treason and sentenced to life imprisonment, as the judge in the case determined that the Constitution did not permit capital treason charges. Some of the nine executions carried out in August 2012 have constitutional implications: those of the three death row inmates convicted of treason, including two army lieutenants and an officer, and the execution of one inmate who had been on death row for murder prior to the entry into force of the 1997 Constitution.It appears that the three inmates convicted of treason were also convicted of murder, but at least eight additional inmates are on death row only for treason. The Constitution contains a transitional provision at Schedule 2, Article 16, which states that all laws providing for the death penalty as of the Constitution’s entry into force were presumed to read “life imprisonment”, modifying the Death Penalty (Restoration) Act of 1995. The execution of prisoners based on a statute that has been superseded by a constitutional change is deeply troubling and undermines ordinary principles of constitutional interpretation even if the changes were not strictly retroactive. The executions appear to have been carried out without prior notification to the families of the victims or to defence counsel, and press accounts have not stated whether the Senegalese embassy was notified before the executions of the two Senegalese nationals. Worldwide reaction to the Gambian executions was swift. Nigerian President Goodluck Jonathan had lobbied President Jammeh on behalf of the Economic Community of West African States, of which The Gambia is a member, encouraging him not to carry out the executions. Additional condemnation came from European leaders soon after Amnesty International and other abolitionist organisations reported that the executions had occurred. The Gambian press noted that Foreign Minister Mamburay Njie was demoted to Minister for Higher Education only hours before the executions took place. 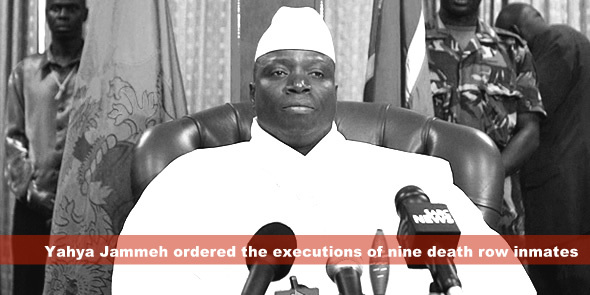 The press reports stated that Njie opposed the executions and tried to convince Jammeh to reverse course. The executions were a show of power by the hybrid civilian-military regime and deeply discouraging to the political opposition, which has a troubled history of persecution under Jammeh’s rule. Undoubtedly, this show of power, pursued at the personal whim of the President, has come at the expense of the rule of law in The Gambia. At the very least, the executions raise more questions than they answer. Andrew Novak has a Master of Science degree in African Politics from the London School of Oriental and African Studies and a Juris Doctor from Boston University School of Law. He is currently the adjunct professor of African law at American University Washington College of Law. The rule of law has clearly been absent in The Gambia for a long time so the actions of Mr Jammeh are hardly surprising. It is encouraging that both ECOWAS and the African Union (through its chairperson, the President of Benin) has taken a clear stance against these executions as opposed to their relative silence in the face of other human rights violations in The Gambia. My crystal ball tells me of heavy political undertones in this matter. i presume this matter will eventually end up at the ACHR….sadly, i dont think the ACHR’s decision will do much help. According to media reports, Gambia’s President Yahya Jammeh has temporarily halted the executions of prisoners on death row. Is there something wrong with this ? “What happens next will be dictated by either a declining violent crime rate, in which case the moratorium will be indefinite, or an increase in violent crime in which case the moratorium will be lifted automatically,” said the statement from Jammeh. Whats the crime rate in Gambia got to do with a death row inmate? Since when was an indefinite death sentence an acceptable outcome?